Sweeping her off her feet is the old way! This year, fly Her Away with You! With Valentine’s Day just weeks away, it can be difficult to find NEW and EXCITING ways to show your love for someone. Did you know that 'Experiences' are the sweet spot? In fact, research shows that EXPERIENCES over standard gifts are what we remember for the rest of our lives. Couple that experience with someone you love, and you will have one of the best memories of your life. 1. Champagne Aerial Tour - Convenient and easy to schedule. Air planes are always fun! 2. Single or Double Passenger Biplane Rides - Convenient, exciting and easy to schedule. 3. Hot Air Balloon - Extremely romantic and exhilarating. 4. Hornblower Ferry Dinner Tours - Low stress and enjoy a dinner while you enjoy the sites. 5. Wine Tasting in Temecula - enjoy nice winter weather and wine plus there are a multitude of Bed and Breakfasts an easy drive away. San Diego Sky Tours have a romantic Champagne Aerial Tour Package. This gift includes the sky and champagne, and if chocolates and flowers are important, we can roll those into a simple upgrade – we want you to have it all! Experiences create emotion-filled memories. Stop trying to fit emotions into a box – give an unboxed gift. The experience that will overwhelm emotions and tie them to wonderful and long-lasting memories. Our Valentines package is affordable, easy to schedule, and makes you look like you have been planning it for weeks! Plus take 20% off with code: BigHeart2018 or 25% off with Military Discount: VictorousVet. Easy and fast to book online (Click HERE), call us after to add balloons or any surprises. Enjoy champagne and the best experience you ever had in San Diego. Possibly see some Whales while flying off the coast. 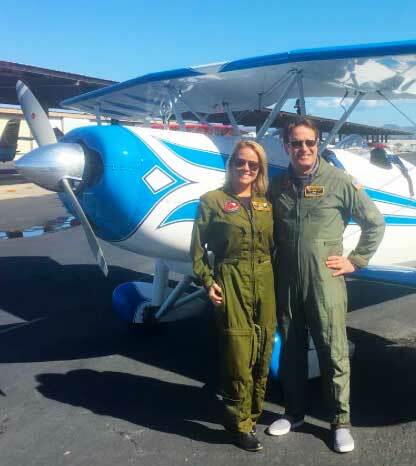 Learn something about aviation and the history/geography of San Diego from a great tour pilot. We have even seen whales out as late as early March, we saw two yesterday. Planning is simple. Once you have chosen your option; 'book' easily online with your requested time, and write any special requests in the notes (we LOVE to help with surprises.) Then you will get a confirmation email with directions and procedures, and how to drive through the gate at the airport. You will park in front of the aircraft, and enjoy the premiere 'private jet' style service with your significant other! Where else can you do this?! No security hassle at our facility and all our pilots are professional and highly experienced, and many have flown, or fly with the military and airlines. Please check out our customer reviews, photos and video are HERE. Afterwards, for a big Valentines win, try a dinner at the Pacific Coast Grill or stay near the field at the 94th Aero Squadron. Both restaurants are superb. Pacific Coast Grill (PCG) has the best view and locale, with superb menu choices. A pilot friend of mine owns it and will treat you right! The 94th Aero Squadron is right on the airfield, has great food, inexpensive drinks and a vintage WW1 Aviators Chateau theme that is exceptional. Both venues have very reasonable prices for what you get in both food quality and overall experience. Not your cup of tea? We know, that in some rare cases, that balloons, helicopters, or aerial Sky Tours may not seem like your cup of tea. However most people don't realize how comfortable, fun and convenient these flights are until they try it. We at Sky Tours say, "You don't know what you don't know!" We giggle when we get another person come through who was nervous but landed ridiculously excited about the experience. EVERY person that is anxious turns out to be super excited. We hope to see you but more importantly have a great Valentines Day!